The Angels shook off the disappointment of 2012, as well as a bad 2013 Major League season, to win promotion back to the First Division in 2014. Joining them will be the Washington Nationals. The Chicago Cubs and Philadelphia Phillies, who each resisted demotion for years, now are headed to the Third Division in 2014. 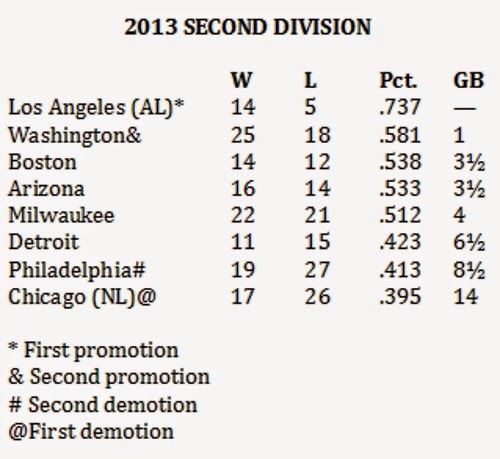 The Angels barely missed promotion to the First Division for the 2013 season. But they earned that promotion with an excellent 2013 season in the Second Division, even though their Major League season went badly. In the Second Division, the Angels played only 19 games, but they were 6-0 against the Detroit Tigers and 3-0 against the Milwaukee Brewers. They only broke even against the Chicago Cubs and Boston Red Sox, but 14-5 is a .737 winning percengage, and they also finished a game ahead of the Washington Nationals. The Nationals are being promoted for the second straight year, going to the First Division in 2014 after starting all of this in the Fourth Division in 2010. During the regular Major League season, the Angels struggled to a 78-84 finish. It also wasn't such a great season for the Nationals, who were heavily favored to repeat as National League East champions and wound up finishing 10 games out of first place. The Chicago Cubs began these standings back in 2010 with Second Division status and somehow floated there for four years, despite consistent losing records. This time, though, they couldn't escape. They came up last in the Second Division and are going to the Third Division in 2014. And the Philadelphia Phillies, a First Division team from 2010 through 2012, now will be demoted for the second straight time, going to the Third Division in 2014.